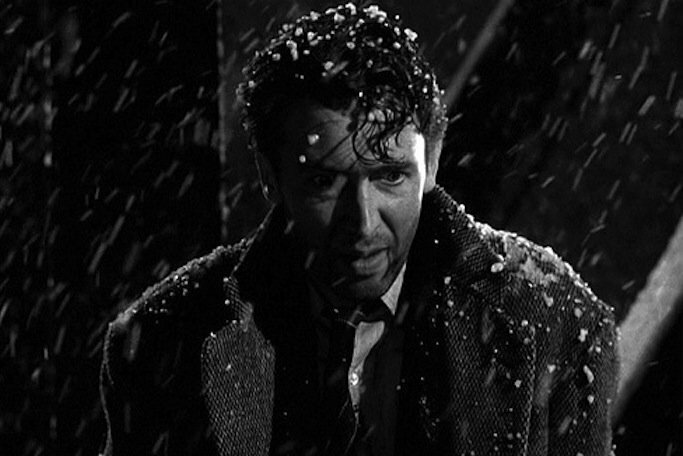 First thing I noticed anew this year watching It’s a Wonderful Life was how happy George Bailey was to be going to jail. He celebrates it, as he bursts through his front door to be greeted by a bank examiner, a journalist, and the sheriff. If those three “walked into a bar” it might not be so hard. Finding them in the living room is a different experience. One of us is going to jail — well it’s not gonna be me! But now he is ready, and indeed willing and able to go. My second note of note is the progression of changes he finds when he wishes he’d never been born. I don’t think I’d quite seen this before. After Clarence grants the wish, Bailey experiences an increasingly radical life differences for others, because he was never there. His experience strikes deeper and deeper into his heart and life, until it hits him as hard as can be: he has no wife. And if no wife, then no children … and no life … and no wife. All along George Bailey wanted something else, but gave it to others. What he wanted was life. And it seemed to him that this life was all he dreamed and wanted and thought he needed. And it was always away or over there or after this or something … else. So by this Christmas Eve, his giving is so ingrained it is easy to jump in to save a drowning man. Just as he did for his brother Harry. And when this time he’s the drowning man, the solution is the same — saving others, though he might not save himself. And he finds the life he has lived is the life he’d been looking for. In his mind and heart he went all the way around the world only to return and find that what he’d sought was right there all along. Right where he was. He is not the first man to make that trip. Deeper and deeper inwarding discovery that his life is in found in being lost, and received in being given. The shouted proclamation It’s not gonna be me! starting as an epithet hurled, ending as exultation learned. Better that all these others in my life should live and love, he says, even if I am ruined. I think he knows he would not be ruined, except in eyes that anyway cannot see. He does not see it or say it as Well, it’s a fair cop. It’s neither regrettable choice nor — certainly not from George Bailey! — good business. It is rather life itself. He chooses others, again. He will endure jail, calumny, grievous loss … and gladly. He will go singing to the scaffold and kiss the rod that strikes him, so long as those he loves are well, so long as he is in good and with God. Please God — I want to live again … I want to live again. It’s not gonna be me.